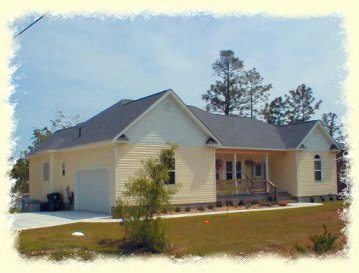 Single Story Home Under 2500 Sq.Ft.-DR990214-Carolina Coastal Designs, Inc. 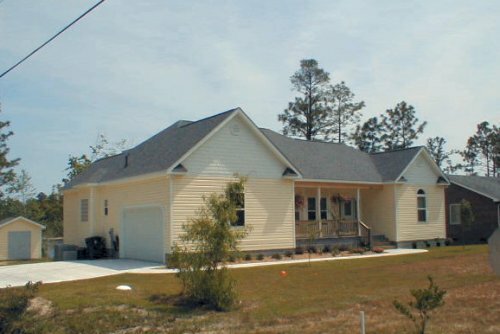 This charming 3-bedroom ranch is set amid live oak and tall pine trees in the countryside community of Boiling Spring Lakes in North Carolina. A cozy southern style covered porch graces the front of this home. A central entry with stately arched doorways leads to an open formal dining room and an expansive great room. A modern kitchen with a snack bar adjoins the brightly-lit breakfast room. The great room has a vent-less gas fireplace and a wall of glass with sliding doors opening to a large open deck that wraps around the rear of the house. 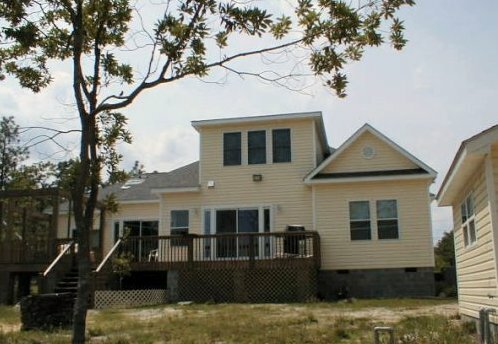 Two bedrooms and a full bath are set along the right side of the home, while the master bedroom suite, with its spa bathroom, is privately situated on the left. A convenient laundry room is located next to the garage entrance. A centrally located staircase leads to a large bonus room on the second floor of this home.